Phoenix Sued for Censoring "Gun Saves Lives"
How Is Gabrielle Giffords Doing? info@gunlaws.com, include your mailing address. I apologize if I gave the wrong impression last time: Pyrodex is NOT "blackpowder" -- it is imitation blackpowder, and will NOT work in flintlock or other "non-percussion" firearms. Thank you Clark J. for blowing that one up. A number of Page Nine readers challenged the idea of a national right-to-carry law or permit, which they think I proposed. I'm not seeking a national law, I called for repeal of all the restrictions on our rights nationally. This would free people to be armed, not "allow" them to be armed (watch out for that word "allow," it implies someone has power over you they should not have). A national carry law would be disastrous, a grant of power not in our interests. Maybe I wasn't clear enough. Repeal. Not enact. The Arizona Gun Map is now in print and available!! 3-foot by 2-foot full-color foldout map of the state. Another successful project of TrainMe.AZ.com! Congressman Trent Franks endorses National Training Week -- when everyone is encouraged to go to the range and practice -- https://www.gunlaws.com/NationalTrainingWeek.htm. That makes three members of Congress who have endorsed the idea -- read all about it at the link above. Ask ranges in your state to support the plan, it's simple, offer free one-hour handgun rentals to newcomers or anyone during 4th of July Week, July 4 to 11. Free publicity, full-color artwork you can download and use, great opportunity to expand business and attract new customers, spread the fun of the shooting sports. YOU should decide to be an ambassador for the project, go to your favorite range, show them the webpage, and convince them to participate. You want to DO something to save our rights? This is it. The public (including you) unknowingly gives the mainstream its power, because at a subconscious level, anything the mainstream pronounces is taken as the “official” version. Everything else then is an argument, a debating point, an alternate reality -- and must compete with the mainstream “official” version for belief. The mainstream commands a win-lose from the get-go. It is the "compared to" effect. Whatever you set up as the comparison is the automatic winner, the compare-to item is the flat-out loser. "Black people are as good as white people," is the perfect example. It may sound fair and balanced, but its outrageous bias is obvious when you say instead, "White people are as good as black people." The thing compared is inferior by default. But it's a hidden bias, and slips right on through. "Female soldiers are as good as male soldiers." You get the point. If the New York Times, or the TV networks or CNN, or other standard bearers of mainstream thought were to make a non-mainstream statement even once --it would become the official version. All other thought would have to be compared against it, and suffer the fate of the compared-to viewpoint. Think what that would do. The vast majority of the public understands the truth of those headlines, they would be exonerated, and would hold the high ground. The truth deniers would be backpedaling so hard they would fall and get bad boo boos. The ACLU would have to begin an uphill campaign against those ideas, instead of the uphill battle the center-right coalition now faces. The whole texture and demeanor of the country and the debate would flip. Leftists and socialists would be on the short end of the stick, and conservatives and libertarians would gain immeasurable sway and power. Wouldn't that be nice. Because the mainstream is not going to voluntarily adopt these views, the best course seems to be to make them increasingly irrelevant, through reduced audience, and increased reliance on everything but them for news and views. In essence, this makes the Internet an extreme threat to the existing power structure, and we can expect it to come under increasing attack and efforts at control -- taxation, filters, content edicts, privacy snooping, unfairness doctrines and non-neutrality called neutrality. My new book, Bomb Jokes at Airports, addresses these issues. P.S. It's not about “carbon footprint” -- it's about “carbon-dioxide footprint” -- the stuff plants need to survive and thrive, a cornerstone of life, the stuff you exhale. Big difference. Remember the people selling “carbon offsets”? Write a check to them and you can take a flight without guilt, believing trees would be planted somewhere with your money? It was such an outrageous scam even when it was running full bore. Now, it is such a scam it's almost in hiding (there are vendors on the web but little else). The gullibility (and self guilt) of some parts of the public is so huge, it suggests people should need to qualify before they can vote, or breathe. 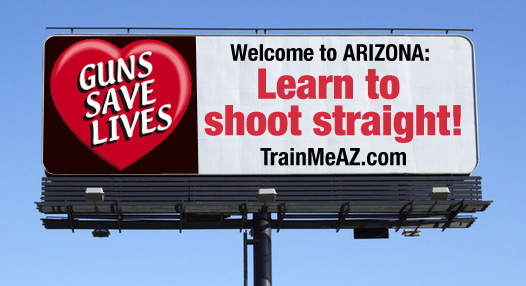 The city of Phoenix has censored 50 ads for the educational program of a local gun-safety training association, TrainMeAZ.com. We oppose censorship in all its forms. the Deer Valley Airport. It escaped censorship because it is not a Phoenix bus stop. Although the "news" media steadfastly censors news about firearms, self-defense cases, new firearm products, the shooting sports and basically anything that confirms that guns are good, save lives, stop crime, and help keep America free -- the media is intolerant of censorship by government, and in this case it's a good thing. I expect the city to repeat its claim that advertising at a public transit shelter is a non-public place. It doesn't make good sense, just like you I know that, but what do you expect from city (or any) government run by HINOs (humans in name only). That's part of our challenge. After the city responds, we'll have 40 days for the next step in the process. If you drive around the city of Phoenix, you’ll likely see at least one poster advertisement at a public bus shelter. Some ads show a juicy hamburger and the logo of a well-known fast-food restaurant. Other ads show tastefully designed wedding rings and the name of a jewelry story. Phoenix officials can oversee the content of advertising on city property to prevent obscene material or truly inappropriate messages. But the government has no business approving one company’s approach to advertising and rejecting another based on one bureaucrat’s view of what is a commercial transaction and what is not. The free speech protections of the First Amendment and the Arizona Constitution require the city to enforce clear and objective standards that treat advertisers in a fair and equal manner. The Arizona Constitution protects free expression to a greater degree than the federal Constitution – it gives every person in the state the right to “freely speak, write and publish.” But the City’s ordinance permits only commercial speech at bus stops, prohibiting all other types of advertisements. This doesn’t comply with the state’s broad speech protections. In Arizona, the government may not favor one type of speech over other types. Today the Goldwater Institute filed a legal challenge against the city of Phoenix for removing advertising for TrainMeAz at 50 Phoenix bus shelters in October 2010. The Phoenix Public Transit Department cannot explain how the TrainMeAz ads are substantially different than other posters that appear on bus stops including the jewelry store, the fast-food restaurant, and weekend gun shows. The Goldwater Institute’s Scharf-Norton Center for Constitutional Litigation represents TrainMeAz LLC and company manager Alan Korwin. We are asking a judge to strike down the city rules that govern bus stop advertising so that new rules can be adopted that provide clear standards for the transit department to follow. As an alternative, the courts also could determine that TrainMeAz’s ads never should have been removed. If this is left unchallenged, there’s a serious risk that bureaucrats will apply their own personal views to determine which ads are accepted or rejected, violating the First Amendment’s protection from arbitrary government censorship. For example, a vegetarian transit official could reject ads featuring hamburgers, or a conservative official could reject ads for businesses associated with liberal causes. Thanks to your support, we are defending the First Amendment rights of business owners. FOX-TV Channel 15 in Phoenix did a lopsided story about the case, and it's nice to be on the lop side for a change, even if it violates ethical journalism. How many ethical violations can you spot? My newest book is now available! Just in time for a free-speech lawsuit against Phoenix to protect our right to arms! The NRA can't buy network time to promote their views or seek members. Kids are dismissed from school for wearing gun-safety T-shirts. "News" media everywhere suppresses the "Guns Save Lives" message. Real self-defense news is routinely censored as a matter of policy. Speech of every sort is banned by courts, federal and state laws, bureaucrats at every level, financial and social forces -- read about the real deal behind the "nappy headed ho" incident that got Don Imus bounced from the airwaves -- pure black racism with a complicit media -- and hundreds of other cases that will make your brains fall out! FREE SPEECH is crumbling all around us. have your business destroyed for an errant phrase. The wrong words can get you killed -- officially or otherwise. There is a way to fight back -- and unused federal laws to put the censors in prison. This book will open your eyes. Homeland Security Chief Janet Napolitano visited the U.S.-Mexico border on Thursday to ensure Americans that it's safe to travel and conduct business across the border. The border is better now than it ever has been." (March 11, 2011). Mr. Obama, the current occupant of the White House, agreed with the assessment, and everyone in the administration, at least publicly, agrees. Part of the reason the captures are low, is because Border Patrol has specific orders to send people back across the border, not arrest them and reduce the strain on the judicial and prison systems. If that isn't blatant deception I don't know what would be. Judicial Watch reports that of the captures, 59,000 are OTMs, Border Patrol's now famous term for Other Than Mexicans. Of those, 663 were from “Special Interest Nations,” a government way of not saying muslims. No other information on these muslims, or what they had with them, is available. Again, these are only captured muslims, the total number of muslims sneaking in from nations of special interest is UNKNOWN. The border, which is about 2,000 miles long, includes 129 miles where we can fully control and stop invading illegals, according to GAO. Another 367 miles has what's called “pedestrian fencing,” the kind a pedestrian has to work at to cross. There's more, but you get the idea. DHS Secretary Napolitano is still in office, despite the travesties perpetrated on the public from her own lips. Rumors that those lips have never kissed a man could neither be confirmed nor denied at press time, and if you want to attack me for an off-color joke, you're one of the reasons I wrote Bomb Jokes At Airports. My latest book points out that otherwise good Americans have soaked up this nonsense about banning speech to protect, well, what exactly? You think banning jokes protects you? If you want to help in the struggle for freedom, get a copy, have some good belly laughs, and learn a mouthful. See hundreds of things you can no longer easily say, as politics cancels the First Amendment. Plus, find out how you can fix the problem. 3- How Is Gabrielle Giffords Doing? Nothing, except everything is fine. Not even the National Enquirer has obtained and released photos, in one of the most thorough blackouts of information in "news" media history. According to a knowledgeable private source in Tucson, where Congresswoman Giffords was assaulted and shot, "she is speaking in one-word and one-phrase expressions, and using a lot of hand gestures. She can take a few steps, and is weak on the right side. She is also expressing great frustration with not being able to say more, and recognizes Nelson. She called him by name." She still holds her democrat seat in Congress, but hasn't voted since the day before the crime. Rumors abound that her handlers will run her for office next time around, regardless of her ability to do the job, and she has gathered large sums for a campaign. We all hope she recovers from her wounds. Osama Bin Laden Is Dead. Osama Bin Laden Is Dead. Osama Bin Laden Is Dead. Osama Bin Laden Is Dead. Osama Bin Laden Is Dead. Osama Bin Laden Is Dead. Osama Bin Laden Is Dead. Osama Bin Laden Is Dead. Osama Bin Laden Is Dead. Osama Bin Laden Is Dead. Osama Bin Laden Is Dead. Osama Bin Laden Is Dead. Osama Bin Laden Is Dead. Osama Bin Laden Is Dead. Osama Bin Laden Is Dead. The U.S. reporting on the apparent death of Osama Bin Laden was disgraceful. A single fact was used for endless hours of repetitious and vacuous reporting. No new news is big news to the “news” media, once big news is released. The U.S. public was treated to thousands of repetitious images of a vile criminal smiling, shooting guns, holding meetings, teaching, walking -- it was a horrendous tribute to a horrendous criminal, remorselessly played for the public ad nauseum. The repetitious-image approach mimicked the "reporting" of the suspect in the Tucson shooting of Gabrielle Giffords for reasons that were unclear at press time. Images of Navy Seals training, shooting, swimming, running, deploying in multiple environments from multiple departure vehicles -- the real heroes in the event -- were not shown, because there was no time left after all the stock images of the dead guy day after day, according to experts. No facts emerged for days, especially the most important facts that were immediately available -- the reaction of Osama's supporters -- vicious and dedicated muslim enemies of the U.S. in nearly 70 nations. We do know that when the twin towers were attacked in 2001, our muslim arch-enemies, who Mr. Obama assures us we are not at war with, were dancing in the streets and giving out candy. Virtually no muslim stood up to condemn the attack back then, casting doubt on Obama's Osama assertions. According to at least half of America, Mr. Obama may believe we are not at war with muslims, but muslims believe they are at war with us. Rumors of Americans now going about fully armed all the time, to deter possible muslim reprisals cannot be confirmed, since smartly armed people do not give up tactical advantage easily. Al Jazeera TV, available to anyone with an Internet connection, ate the U.S. media's lunch on the issue. While American talking heads were speculating and pontificating, and congratulating themselves on the glorious but ten-year-late victory, Al Jazeera was on the ground in muslim country after muslim country, covering what's going on in the belly of the beast. No grandstand cheering could be found from the religion of peace, now that its most prominent figure was apparently disposed of and, in true Mafia style, turned into fish bait. Contrary to the words of Mr. Obama, Osama bin laden was not brought to justice, a tasteful euphemism preferred by girliemen in a position of power. He was put to death, a significant difference, especially to the dead person, according to leading experts who refused to be identified. The same experts point out that Obama's Osama victory was due in large measure to Obama's predecessors. Obama's actions in office actually severely weakened our fight against muslims, a fact easily studied with a simple Google search (banning effective interrogations, reducing assets, changing language and terms to protect the religion of peace from oprobrium, etc.). According to Al Jazeera sources, locals reported a heavy-duty mission underway, with multiple helicopters running with lights off. Contributors in Pakistan (pronounced pock-EE-ston according to Obama) had long believed he was long dead. No clear representation of how much ISI -- Pakistani intelligence -- were involved, and if they were, unclear what reprisals that might generate. Real news agencies would have Arabic-speaking reporters attending mosques around the world and reporting on what was going on there, you think? Your gun's hot. The perp's not. Now what?" A deadly loophole in self-defense law has been uncovered and exposed. Experts disagree on this -- and your life and freedom are on the line. or even thinking about it -- but it's the hottest self-defense book in America today. some of which could work for you or your state. A fascinating easy read, reviews have been exceptional. "NICS accidentally flags many law-abiding people, stopping those who simply have the same name as a prohibited individual from buying a gun. A similar problem occurred five times for the late Senator Ted Kennedy when he was placed on a no-fly list. An initial denial does not mean an individual is actually disqualified from owning a gun." Using those initial denials to draw conclusions would violate every principle of accuracy, but it hasn't stopped anti-rights bigots from bragging about how good NICS is. Take the numbers for 2008, the latest available. There were 78,906 initial denials. But of those, only 5,573, or 7%, were referred to BATFE for further investigation. So what about all the rest of the denials? A report by the U.S. Department of Justice indicates, "The remaining denials (73,333 - 93%) did not meet referral guidelines or were overturned after review by Brady Operations or after the FBI received additional information." Lott makes this clear -- "To put it differently, the initial review didn't find that these individuals had a record that prevented them from buying a gun." Relax, it gets worse. Of the 5,573 referred for review, over 44%, (2,472), involve "delayed denials," meaning a check hasn't been completed. Only 3,101 covered cases where initial reviews indicated that the person should have been denied buying a gun. "But the government admits that upon further review about a fifth of these referrals involved 'no potential or unfounded' violations of the law, leaving about 4,400 cases. That implies an initial false positive rate of roughly 94.4%," according to Dr. Lott. Up until this point, the merits of the case has entered the picture. If a review of the records indicates that someone is a prohibited individual, they are included in the numbers. But of these 4,400 cases, only 147 seemed serious enough to refer to prosecutors. Of those 147, prosecutors thought the evidence was strong enough to bring a case only 105 times. Bottom line, 78,906 NICS denials yielded 105 cases, about a tenth of a percent, and that's without knowing if anyone was found guilty. At least, the system only costs us hundreds of millions of dollars. Wyoming has become the fourth state in the Union to remove the infringement on its residents' right to discreetly keep and bear arms. Residents of the Equal Rights state, which has the lowest population of any state in the country, no longer need a government-issued permission slip to simply carry firearms discreetly, treating firearms pretty much like any other privately held property. Although the law currently only applies to Wyoming residents, experts believe it should be extended to anyone legally present in the state, as Arizona did when it enacted similar legislation in 2010. The national movement to ban government control of a fundamental human right is expected to gain traction in the next few years, as everyone learns that freeing people to exercise their rights does no harm. Nothing. If it involves the arms industry, you get zero reporting. This is called diversity. Alliant TechSystems, one of the nation's leading ammunition makers, has announced it has received a contract from the U.S. Navy, worth $49 million. The money has been used to develop a "new special operations ammunition round with improved accuracy, stronger barrier penetration and a lower muzzle-flash." ATK Security and Sporting developed the round in partnership with the Naval Surface Warfare Center - Crane Division under the Special Operations Science and Technology (SOST) ammunition program. The U.S. has so many ammo and weapons developers your head would spin if the media ever reported on even a fraction of them all. Contracts like this are issued on a regular basis. The ammo is being produced in 5.56x45mm and 7.62x51mm calibers, and is short-barrel optimized. It is designed for use with the MK16 and MK17 Special Operations Combat Assault Rifle Weapon System. This is not consumer ammo, but it sure makes you want to try some. Production will be handled at ATK's Federal Premium Ammunition plant in Anoka, MN. Deliveries are expected to be completed in 2015. A public company, Alliant trades on the New York Stock Exchange, ticker symbol ATK. 7- Leader of Brady Group Gloats About Coming Gun "Proposals"
Paul Helmke, ringleader of the aggressive Brady Anti-Gun gang, released this statement about the "bipartisan" gun-control meeting the White House scheduled. (Note: The "White House" is a building and can't do anything; the person responsible in that building remains unidentified.) The meeting only included people who want to ban guns, an indicator of the plans, according to unidentifiable experts. "On Tuesday, I attended a meeting at the U.S. Department of Justice with representatives from the White House, the Vice-President's office, the Bureau of Alcohol, Tobacco, Firearms and Explosives (ATF), the FBI, and others from the Obama Administration, along with leaders from the gun violence prevention movement, to discuss how to reach the goals outlined in the President's statement. Officials from the Administration indicated that this was the first of what they hoped would be a series of discussions. They said they had not settled on, or excluded, any relevant proposals. "I began the discussion by listing basic measures that the Brady Campaign, and others, felt could make a difference. The list included: a strong background check system, with good and complete records of dangerous and irresponsible people, applicable to all commercial gun sales; more tools for law enforcement to stop trafficking in illegal guns; increasing the number and type of military-style weapons, including “assault clips,” that should not be readily available to civilians, like machine-guns and fully automatic weapons. Administration officials then asked questions. My colleagues and I gave examples and arguments for legislative, administrative, and voluntary policies that could help reduce the bloodshed. "The meeting lasted more than 90 minutes. Having this many Administration representatives spend this much time on this initial meeting signaled to me that the president is serious. He wants to do something meaningful about gun violence. After meeting with others, including law enforcement and “gun rights” groups [note: no such meetings are known to have been held], Obama's representatives will be presenting specific proposals. We hope those will include all the “sound and effective steps” that the president called for in his statement." No word has leaked on what or how the anti-rights leaders will attempt to implement their programs. Rumors are swirling that every effort will be made to avoid going through Congress, since it is well recognized that the peoples' representatives there will not tolerate rights denial programs. Avoiding Congress would be a travesty bordering on treason, but since it is just one of many such moves, objections might be slight, and arrests of the perpetrators seem unlikely. One leading gun-rights advocate, who was not invited to the "open" discussions, opined, "A seat at the table would be good, but only if used to present reasonable ideas -- gun curricula, self-defense protections, justice for civil-rights violators (just injecting civil rights into the lexicon would be good), gun-free zones vs. make-believe gun-free zones, the debilitating effects of hoplophobia and failure to recognize or treat the sufferers, and have the antis dismiss such common-sense measures; also a chance to stand against the anti-rights movement and cast them as such. I'm not sure which gun-rights leader is best suited to that. I'd love to have a crack at it, but I wasn't invited." An opportunity to do any of that was considered unlikely. There are serious issues American gun owners want discussed, such as restoration of rights, national concealed-carry reciprocity, cracking down on states like New Jersey, New York and California that routinely violate gun owners rights, lifting the administration's ban on importation of historic WWII-era rifles, reining in the Bureau of Alcohol, Tobacco, Firearms and Explosives, especially the Phoenix office and its Fast and Furious and GunWalker operations, and the nomination of anti-gun rights Andrew Traver to head BATFE. Plans to strip Americans of their guns, either in whole cloth or with a thousand cuts, are deep secrets at both the center of the U.S. government, and at the United Nations, which are known to be working in concert to attain those goals. We'll be watching. My co-author on Sunshine Gun Laws -- a tongue-in-cheek list of great gun laws we ought to have -- has just come up with another beauty. Rock on with your bad self, Mark Moritz! If you can demonstrate (to the local sheriff, state police or other proper authority) that you have a good reason why you should not carry a gun, then after attending a 40-hour class, paying a fee, being fingerprinted and photographed, and having your background checked, you can get a card that says you have permission to not carry a gun. Anyone caught not carrying a gun, without the permission slip to be unarmed, can be prosecuted for a misdemeanor. In any contact with a police officer, you must declare that you are unarmed, and you must show your permit. Failure to show the permit is a misdemeanor. Showing bad attitude toward the officer is grounds for an additional charge of reckless endangerment, since going unarmed is known to aid and abet the criminal element. After enactment, newspapers are authorized to publish the names of all people who have no-gun permits, for safety. Brand new -- Just released -- Unlike any book you own! gun buffs just like you. The idea that America stands alone in bullpucky. the right to arms, but this is a universally recognized human right. Some nations are far more tyrannical for sure, and some are better than us. for gun owners around the world. "Read it for the planet." Now in stock and available for immediate shipment! America does not stand alone against the forces who would disarm you. Your image of guns and gun rights will shift when your browse this book. Is your family from Italy? Poland? China? Ireland? Sixty other nations? Find out what gun laws are like in your homeland. See what Israel, Canada, England and Mexico are really like. 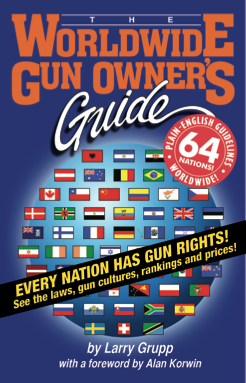 Every nation is ranked for gun freedom, from 1 to 64. Freedom-loving Switzerland is #5 -- four points ahead of the U.S.!! 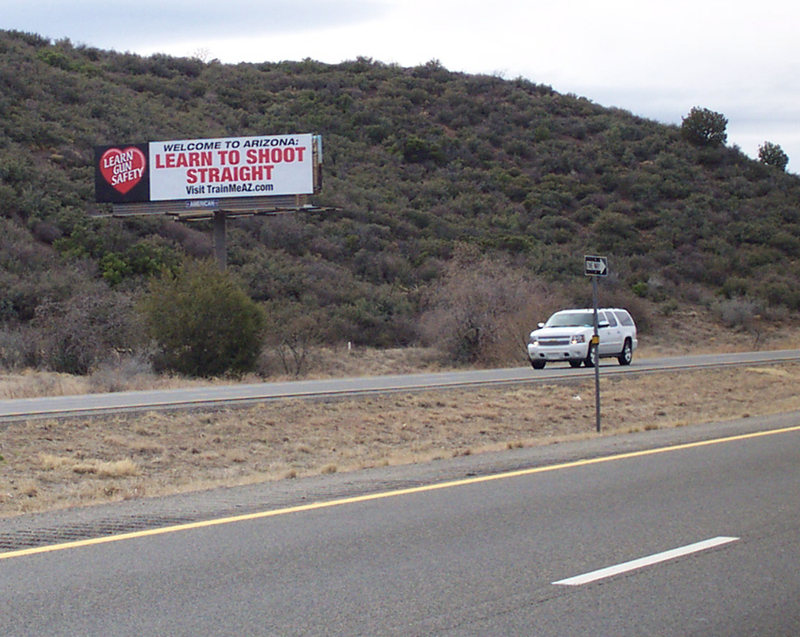 Drivers heading into Prescott get the TrainMeAZ message. Sky Harbor International Airport on 24th Street. Alan, if you think this idea will make us safer [repeal of gun-rights infringements], you are nuts! The more guns, the more violence. What gun manufacturer do you work for? The idea that we will be safer by putting more guns out there is absolutely crazy. Our country is one of the most violent upscale countries in the world and it is a direct result of the ease which we can get guns. Having the right to bear arms to form a militia, has been turned into our nation returning to the wild and very dangerous wild west. The idea we can only settle our differences with the expansion of guns it absolutely insane. The right to bear arms can and is consistent with safety but that doesn't mean we all need to be packing guns. It is sad people like you push the idea that more violence will result in less violence. Shame on you. Gun ounership carries responsibilities and one is to assure that nust like you can't get their hands on guns . The idea of carrying guns to political events is like taking guns to polling places in the south, simple intimidation and infact is a call to violence by you! By carrying guns to public places simply send the message that well we can't talk this our with reason, rather let's shoot it out. --Steve M.